This letter and more can be marvelled at in Karren’s new book The City is Ablaze! The Story of a Post-Punk Popzine,1984-1994. The book is a compendium of the zine that contains interviews with the likes of Sonic Youth, The Pixies, Hole, The Pastels and more. The book also features new writings by Karren and other members of the Ablaze! team, along with essays by DIY cultural commentators and an interesting re-examination of the Riot Grrrl movement. Culture Vulture asked Karren some questions about her new book, as well as her fascinating life as the Ablaze! proprietor. Hi Karren. How did the idea of putting together a fanzine come about at such a young age? Was there anything in particular that spurred you on to get Ablaze! started? Hey Hayley! I used to listen to John Peel and he’d talk about fanzines and give the addresses to send off 20p and a stamped addressed envelope to. I also picked them up in record shops, so I was aware of them from when I first got into ‘alternative music’ as it was called in the 1980s. It didn’t naturally occur to me to write my own – fanzine writerdom seemed to be a ream of higher beings, but I was encouraged by hearing some kids on a radio show exhorting people to DIY, explaining how easy it was to do a zine (I wonder who they were). I attempted to do a zine called The Value of Defiance whilst at school but lacked the confidence and support to finish it and get it printed. At college I did a tiny zine called Karanoia 86/I hate punks. It consisted of 2 sheets of A4 paper folded to make an 8 page A5 zine. I photocopied 5 of them and found out that the world did not end – on the contrary, the world began. My friends liked it; that was all I needed, a little bit of encouragement. Everything got incrementally bigger from then on. 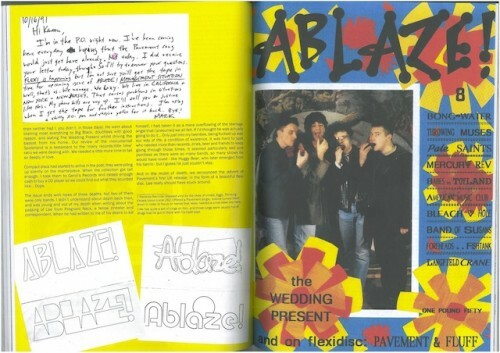 In 1987 I put together a zine and compilation tape of Manchester bands called Made in Manchester, and then had the idea to do a regular zine called Ablaze! I’ve always felt that fanzines have been an important part of fostering a music community, especially regarding lesser known bands not covered by mainstream media. Is this something that you set out to do with Ablaze! ? Certainly in the 80s and 90s fanzines were a crucial part of scene infrastructure. I definitely had an agenda with the Made in Manchester project to promote bands that were not widely known (including The Stone Roses!). Ablaze! did champion the local bands that I and other writers adored, but my main focus was on music I loved wherever it was being made and regardless of how famous/unknown the artists were. Did you feel disconnected from the music scene before you started the zine? Not totally. Before I did a zine I forged connections with zine writers and radio show presenters through prolific letter writing. Once I started a zine the connections grew in number and I was able to meet more people who were doing interesting stuff with music, writing and radio. In the book I’ve interviewed Pik, who, as a student, single-handedly ran a pirate station from the Manchester rooftops. I also interviewed Simon Morris, an artist who produced a Dadaist zine called Turnip Flag, played in The Ceramic Hobs and went on to become an inspiring figure in the Mad Pride movement. These were the first two friends I made when I went out to sell Ablaze! 1 at gigs! Doing a zine meant that my world got bigger, faster. I noticed you covered a lot of bands that time has forgotten. Looking back, who were your favourite artists who aren’t so well remembered now? Fluff were a 3 piece based in Leeds. Their songs were short, intelligently assembled and really, really poppy – and by that I mean the kind of songs you can’t stop playing; the ones that are so good they have to stay on repeat. That band did disappear without a trace, a fact that has always pained me. Shudder To Think from Washington DC and Live Skull from New York were both under-celebrated in relation to the grandeur of their respective outputs. So, tell us about your new book The City is Ablaze! The Story of A Post-Punk Popzine, 1984-1994. What made you decide to put the book together? It had been on my mind for a while. I had been working as a copywriter without much success, and it occurred to me that I had something that I could write about that others might be interested in. The book’s been greeted by great enthusiasm, so I guess I made the right choice! Was the decision to publish it yourself based around the DIY ethic you employed from the emerging punk scene during your time making Ablaze! ? I decided to self-publish because I had done it before and I knew how ‘easy’ it was – i.e. really hard work but achievable. I worked out that book publishing is basically book production, promotion and distribution. We’re distributing it ourselves in the UK, i.e. without going through a book or record distributor, which is a slog but kind of fun as it involves tapping into those familiar networks of friends and musicians in cities across the land. What music are you currently listening to? Are there any new bands that would be Ablaze! regulars if it was still going now? Are there any modern artists that you feel have the staying power to be as potentially influential as some of the artists of your [zine-] active years? I really rate Cowtown from Leeds. They deserve to be on the world stage, whatever that is – a really large stage in my imagination! They should have been booked to play the London Olympics opening ceremony. Other amazing Leeds bands are D’astro, The Seven Inches, Monster Killed By Laser, Executive Legs and Autobodies. Wooderson from Sheffield are intensely wonderful and I adore three bands from Bristol – So-eza, Jelas and Do It Do It Do It. In terms of bands that will be influential in the future, it’s difficult to say, but Leeds riot grrrl/queercore combo Jesus and His Judgemental Father could easily be entertaining the teenagers of the world with their incredible punk pop songwriting. They also look amazing – real life cartoon superheroes! Have you got any advice for anyone wanting to start their own fanzine? In terms of whether to put out a paper zine or work electronically, I think Natalie Bradbury who does Shrieking Violet zine gives a good example of how to operate one now, because she simultaneously publishes a blog and a paper zine. While thousands read the blog and only dozens buy the paper zine, she is covering both angles. I also feel that zine writers can afford to break out of the zine fair circuit, as wonderful as it is, and go back to selling zines at gigs and in record shops, so that they’re available for a wider audience. DO IT! Otherwise how will you know what you are capable of? You can buy Karren’s new book The City is Ablaze! 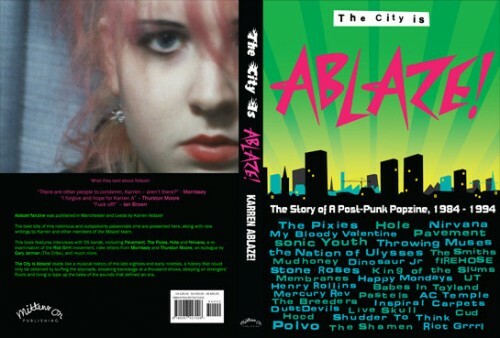 A Story of A Post-Punk Popzine, 1984-1994 from thecityisablaze.com. 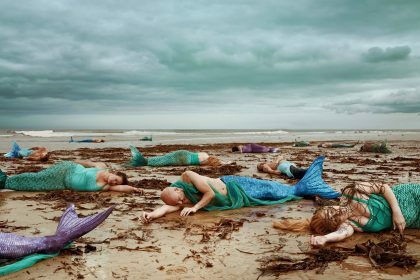 Previous Post:Feminism, Sexism and Culture – oh my!